Film critic and historian Charles Champlin once wrote, “The Hitchcock touch had four hands, and two were Alma’s.” In “Alma Hitchcock: The Woman Behind the Man,” Pat Hitchcock O’Connell and Laurent Bouzereau create an affectionate portray of the woman who inspired so much of Alfred Hitchcock’s work, Alma Lucy Reville Hitchcock. Born in 1899, just one day after her future husband, Alma joined England’s nascent film industry before Hitchcock, having grown up around the corner from Twickenham Studios. Film seems to have been her destiny; her father worked at Twickenham, and Alma was fascinated by movies. She broke into the business while still in her teens, doing odd jobs, learning how to edit films, and even appearing before the camera in a few films. All this would lead to a partnership with young Alfred Hitchcock that would develop into both collaboration and marriage. O’Connell paints a vivid picture of these early days, providing details and photography that few have seen before. The pictures reveal young Alma as a tiny dancer and actress, with long dark hair and a twinkle in her eye. After the missteps of the early Hitchcock films “The Pleasure Garden” and “The Mountain Eagle,” the newly married couple experienced their first success with “The Lodger.” While describing those early days, O’Connell makes the reader feel at home at the Hitchcocks’ Shamley Green home, recalling in great detail the transition to Hollywood and her parents’ high and low points. And when O’Connell began her own acting career, Alma was there for her daughter, offering support without getting too involved. 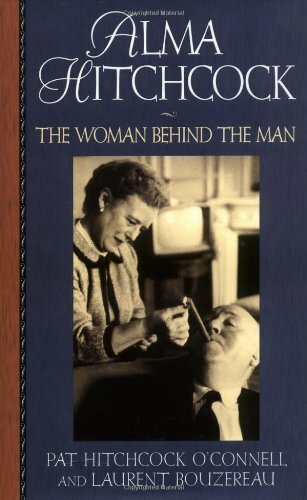 If you aren’t already intrigued by “Alma Hitchcock: The Woman Behind the Man,” O’Connell ices the cake by dedicating the last 50 pages of the book to her mother’s recipes, giving us new insight into the Master of Suspense’s tastes and shedding light on those legendary dinners at chez Hitchcock. Alma was an accomplished cook, and Hitchcock was happy to do the cleaning up afterward. A 1963 dinner for Sean Connery, for example, began with caviar, vodka and cheese rolls, moved on to mushroom soup, continued with lamb and mint sauce, peas, potatoes, gravy, followed by brie cheese and crackers, and finished with raspberry ice cream with pineapple, coffee and liquors. It’s enough to whet anyone’s appetite.